This is death. This is the heartbreak that inevitably comes for all of us when we open our hearts to receive love from another sentient being. From someone we showered with affection from the moment we first met. From someone who shared so much of our joys, sorrows, and laughter, and was ever supportive of us, unconditionally. From someone who we will miss with every fibre of our being from this moment on. Exactly two weeks ago today, I had to say a final goodbye to somebody very special to me. He passed away in my arms, in our living room, while I whispered gentle words of love and gratitude into his ears. He took his last breath a mere two seconds following the lethal injection I authorized his doctor - who was sitting on my living room area rug a foot away from us, along with her attending nurse - to give to him. "I love you," I whispered to him, between kisses, "I'm so grateful to you for all the love you showed me. Now go Home. Find the Light. Find your loved ones in Spirit. They'll take care of you. You'll always be in my heart." The doctor used her stethoscope to listen to his heart a few heartbeats after the injection, and quietly said to me "He's gone." That's when all the strength I had been stoically holding onto for my loved one's sake dissolved into the ether, and I burst into tears while burying my face into his neck. His nurse and doctor also began tearing up, watching this sombre scene of finality. Between sobs, I asked "What time is it?" "8:10 PM," they both replied in unison. Maybe it's all the mindfulness that I practice and teach, but in that moment, I desperately needed an anchor to keep me tethered to this earth, rather than getting lost in my thoughts of worry for him as he embarked on his new journey without me to care for him as I always had. Feel his softness, and the weight of his emaciated body in my arms, I said to myself. Be with the hollowness in the pit of my stomach, and the tightness in my chest. Feel the wetness of my cheeks from all the sobbing. Look at this lifeless form you're clinging to; all essence of my beloved now - so suddenly - vanished. Pay attention to the song and lyrics softly playing in the background, on shuffle, on my iTunes playlist. Fittingly, it's The Tragically Hip. The verse in question: "Rain falls in real time and rain fell through the night. No dress rehearsal, this is our life." Grief is grief, whether the deceased was human or animal. This is the exact moment my world lost some of its vital sparkle. It was at this precise time that I lost my happy. My loved one's name was Happy. He weighed 8 pounds, had four legs, and sported the softest cottony white fur. He was a gentle and playful fur ball of love who genuinely lived up to his name. The nurse in the scene above is a veterinary technician. The doctor was his longtime vet, who euthanized him at my home in Toronto upon my request because I wanted him surrounded by everything he knew and loved, especially after he had just been released from a six day stay at a Montreal-area hospital where everyone only spoke to him in French, a language he didn't understand. I wanted his final moments to be comfortable, serene and tender. I like to think this was my parting gift to him -- a moment of abundant gratitude for his 8 years of dedicated and unconditionally loving service to me. Happy may have been "just a dog" to many, but he was my fur baby the instant I met him at three weeks of age. I was his pet parent the moment I brought him home at nine weeks, when he only weighed 2.3 pounds and fit into the palm of my hands. He was my responsibility when I house trained him, when I cooked for him and bathed him, when I diligently socialized him at the dog park daily, and when I attended puppy school with him. He was my baby at only six months of age, when I began an eight year journey with anticipatory grief, after his vet diagnosed him with congenital chronic renal failure and told me he likely wouldn't live to see his second birthday. He was eight and a half when he died, baffling his doctors at every checkup along the way. "Just a pet" to some. To me though, Happy was my happy. It was as his mom on June 27, when I made the most difficult decision anyone has to face when I called his vet after 5 PM, and tearfully said to her "Happy is ready to go. Please come over and help him." "Just a pet" to some. To me though, Happy was my happy. 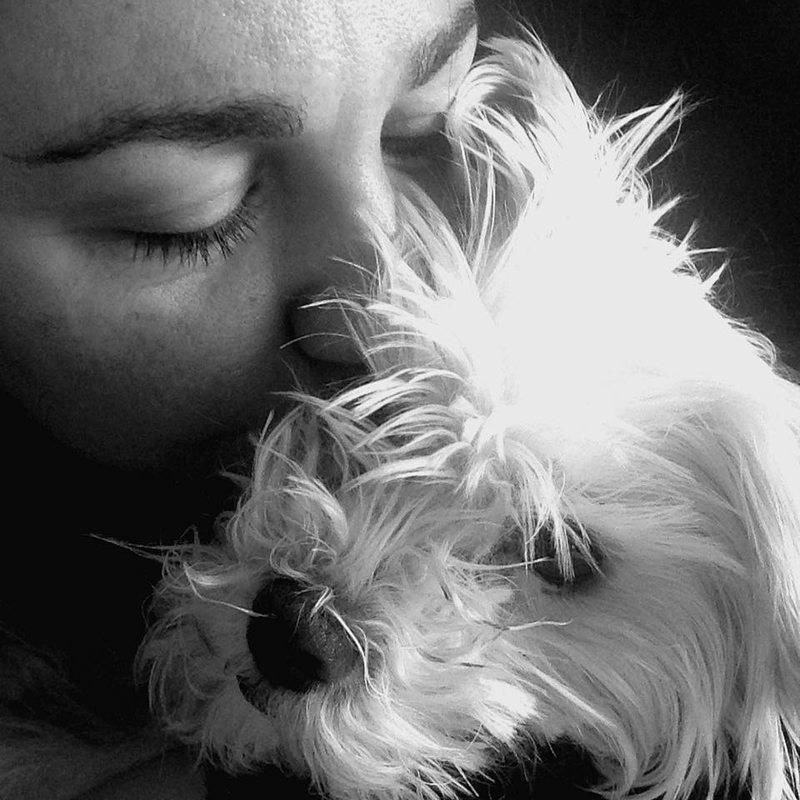 He was my first pet, and someone who opened my heart like a flower and filled it with unconditional love. Death and grief are certainties in life. When a cherished pet dies, the experience of grief and bereavement are no different than mourning the death of a person we have loved. Pet loss is real, significant, and heart wrenching. The feelings of sadness, loneliness, guilt, or anger don't discriminate because the deceased was a pet. Our society's customs around human loss are well established - we have funerals, religious ceremonies, and we are encouraged to share our stories and memories of the deceased. In Judaism for instance, the bereaved formally mourn for seven days of shiva, during which the bereaved is surrounded by, and lifted up, by their community. Similarly, in Hinduism, the mourning period is over 13 days. We've all heard of Irish wakes. Yet there are no such established norms for pet loss. We're not exactly encouraged to share our feelings. While most employers offer bereavement leave for the loss of human family members or friends, few do the same for pet loss. Unfortunately too, many pet owners may be faced with well-meaning but insensitive individuals who often cannot appreciate the deep bonds we have with our companion animals, nor the magnitude of their deaths. Some non-pet people may be shocked by the intensity of the grief felt by bereaved pet owners, and may minimize the experience with thoughtless remarks about it being "just an animal" or that we can get over our sadness by "just adopting another dog." To me, comments such as these are no different than callously telling a woman who may be struggling with infertility or who has just miscarried to simply "adopt" or "try again next time." If you are grieving for your beloved pet, I encourage you to read Martha Tousley's Bill of Rights for Grieving Animal Lovers. It was shared with me at a recent pet bereavement support group I attended, and I have found it comforting as I navigate through the loss of my Happy. Give yourself the sacred space in which to grieve your companion fully and completely. Educate yourself about pet bereavement, and try to find a pet loss support group or counsellor, if you can. Surround yourself with people who understand. Acknowledge your feelings, and understand that some days, it may feel as though you're navigating powerful waves of sadness crashing all over you, while other days may feel gentler in their stillness. Allow yourself to remember your pet in life; hopefully you have lots of photos and videos to help you with this. To all the pet parents who are reading this, I'd like to share one piece of advice I've been telling as many pet friends as possible the past two weeks: please take lots of pictures and video snippets, and upload them to your social media (even if set to "private") as a back-up! This shouldn't be too hard, given most of us have great cameras on our smartphones. But trust me, videos will be precious keepsakes in your moments of sorrow. They've lifted me up during my sleepless nights since Happy's transition. And finally, to those of you who don't consider yourselves "pet people", and have made it this far in reading this blog post: thank you for allowing me this platform to share with you that grief is grief, whether the deceased was human or animal. We are all sentient beings who are walking sometimes difficult roads along this journey of Life. No dress rehearsal; this is our life.